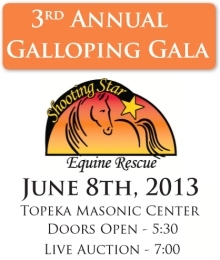 Volunteer | Shooting Star Equine Rescue, Inc. Volunteers are critical to the success of Shooting Star !! Please consider joining our efforts if you have a little extra time, if you love being around horses and like-minded people, and if you want to feel good about making a difference. Immediate need for someone to mow pastures this spring !! Volunteers are always needed to help with fundraising, networking, and community education. Needed to help groom, exercise, feed, and spend loving one on one time with rescued equines. Needed to help provide assessment/training on the ground and under saddle. Help with mucking, fencing, and physical tasks. Thank you for your interest in volunteering for Shooting Star Equine Rescue, Inc.
We take in equines that come to us from owner surrender or seizure due to abuse or neglect or because they were determined at high risk for going to slaughter. Equines are initially assessed to determine health and training needs so an individual feeding and rehabilitation plan can be started. Although a few horses become sanctuary residents and need to remain at the rescue due to complicating conditions such as blindness or medical issues, we make every effort to eventually locate approved placement homes with individuals prepared to meet the needs of the equines as they become available. Occasionally, due to the inability to take in another horse, horses in need may be transferred to another reliable KS horse rescue program that will be responsible for the care and placement process. This program was created informally in September 2002 after Careen was involved in rescuing 23 registered quarter horses from a horribly neglectful situation. A total of nearly 50 horses were eventually removed. It has evolved into an incorporated equine rescue that has helped to place over 500 horses, donkeys, ponies and mules. Dependable volunteers will be essential to the growth of this program as we strive to maintain a quality environment for the horses, which offers individual care and attention. A high standard of care demonstrating respect and acceptable non-abusive methods of interacting with the equines is maintained at all times. These horses and donkeys are our family members and shall be treated with love, nurturing, and the same level of care as one would treat their own horse or beloved pet. Because horses are large animals and can be unpredictable at times, it is always critical to demonstrate safe handling and do all we can to prevent accidents before they can happen. A release of liability form must be signed prior to the volunteer experience. Picking up and organizing the barn and horse environment, sweeping and shoveling, stall mucking, repairs, painting, fencing, etc. Copy and hand out/post flyers or brochures, participate in community events, speaking, writing/sending thank you’s, computer work, phone calls (references, potential homes, etc.). Must have experience relevant to the assignment. Volunteer must know how to halter, lead and handle horses safely. Horse grooming and exercising is needed for horses able to be safely handled by the experienced volunteer. Because many of the horses are in need of gentling, work with haltering and leading, or need to gain more time under saddle, it is important that anyone desiring to work with horses in these areas be experienced and supervised initially by Careen or a lead volunteer. Gentling, ground training and riding is an important step in helping many of these horses overcome trust or fear issues and should first be approved and under the supervision of Careen or a lead volunteer. Volunteers should not enter stalls or the pasture without approval. Lead volunteers are those volunteers having contributed over 50 hours and who have mastered horse safety and training techniques through at least 2 years of horse experience. Guidelines for volunteers at the barn | Drop-in volunteering is not available at this time. Must be 16 or older. Exceptions may be made with Girl Scouts, 4-H groups, etc. when under supervision of group leader. For safety reasons, volunteers must wear appropriate shoes (boots, heavy hiking boots, riding boots with heel if riding) if around the horses for grooming, walking, or riding. Tennis shoes or other light shoes may only be worn for duties such as cleaning, painting or non-horse related activities. No sandals or flip flops, etc. due to safety. Absolutely no riding or working with horses without proper shoes. Volunteers should volunteer at a regularly scheduled time made available to Careen, which will be posted. If this is not possible due to the need for flexibility, Careen should be notified at least 4 hours in advance of desired time to volunteer. Careen should be on the premises at any time volunteers are present unless prior arrangements have been made. Volunteers are always needed and the horses love their special one on one time. In fact, many will see who can get to you first to have that halter put on for grooming. Upcoming Volunteer Training and Orientation: Scheduled for Sat. April 13th from 1-3 at the Rescue. Please contact Careen at careenc@msn.com or 249-1760 if interested in attending.